Employee wellness programs are changing. Where they were once programs implemented because of their benefits with health claims containment, they are now becoming an essential piece of a benefits package. Employers are always looking for the most engaged and productive employees. But how do they recruit and retain them? Offering competitive benefits is one way of drawing in top recruits. In addition to traditional health insurance and savings benefits, employees are looking for a variety of other items. Many of these sought-after items can be viewed as part of a well-being program. According to the 2017 Well-being Prospectus presented by Shortlister, total well-being is the number one component desired in wellness programs. Total well-being is viewed differently by everyone. However, traditionally, it includes some combination of physical, spiritual, emotional, financial, mental, intellectual, and often environmental factors. Many think total well-being is a new concept—not so! For example, the Greeks understood the importance of mind-body spirit as part of their well-being—initially in sports but then also in everyday living. Additionally, the first noting of occupational disease was by an Italian physician prior to the Industrial Revolution in 1810. And in 1817, a social reformer proposed work-life balance, suggesting workers work 8 hours, engage in recreation for 8 hours, and sleep for 8 hours. Good advice! In 1914 the Ford Company instituted this policy and saw a great return. Emotional well-being has been recognized since 1950 with the introduction of Employee Assistance Programs (EAP), dealing primarily with mental health issues—often created from Stress!—and alcohol abuse. Our society still struggles with stress management, and this has only increased with the acceleration of technology. Also being added to wellness programs are ‘niche’ programs. Extending offerings to employees in areas such as nutrition and exercise are certainly important, but many participants are looking for programs that will do more. They desire programs that will enhance their financial well-being, their work-life balance, specific chronic conditions—such as Preventing Type 2 diabetes—and specific behaviors—such as smoking cessation. In 1979, Johnson & Johnson introduced the Live for Life program, which included education and wellness coaching in their model worksite health promotion plan. At the time, the focus was primarily on fitness and assessments, looking specifically at the physical wellness of employees. As mentioned, wellness has grown from having a physical wellness focus to having a total well-being focus. However, we still struggle with changing employees’ behaviors. The introduction of wireless step-counters has intensified the focus on movement and added a social component. However, step challenges are not for everyone. Family involvement has also grown as an important component and has inspired many participants to focus on their health. Additionally, wellness coaching—having a health coach walk alongside participants, tailor plans, and help them achieve their optimal well-being—has also become a vital part of total well-being. But is this enough? According to the 2017 Wellness Prospectus, there is another piece that Balanced Wellness LLC views as the core of the program. It is our ‘hub’ of the wellness wheel: the wellness program as a business objective! Oftentimes wellness programs are ‘set apart programs’, rather than being integrated into the core values and goals of the organization. We know that senior support is crucial to the success of a wellness program. When senior support recognizes the importance of offering a total well-being program, they make a statement. Particularly, they declare that wellness is more than cost containment; it’s an investment that signals care for employees, builds a strong culture within their organization, and has the potential to attract new employees—because after all, doesn’t the best talent want to work for employers who care? 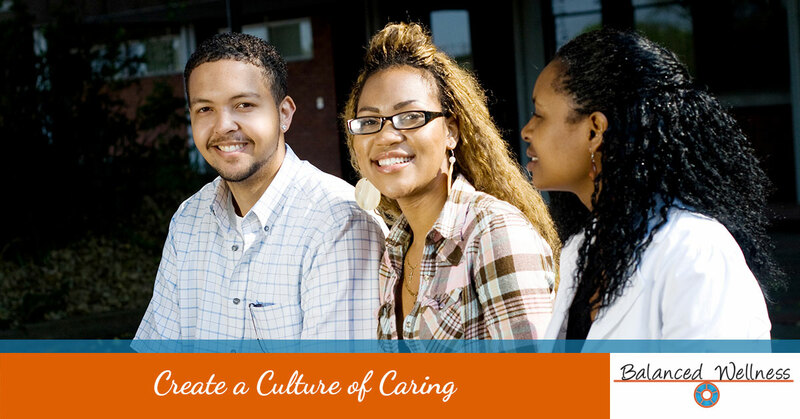 Creating a culture of caring for the ‘company family’, sets the stage for employee engagement. And employee engagement encourages employee productivity! Creating a culture of caring doesn’t mean you need to include all the components of a total well-being approach. Rather, it means that you begin by creating a program that aligns with the company’s core values. So what’s the best way to attract productive employees and retain them? How about investing in the values of your organization and declaring that you’re an organization that cares about its employees.